Our robed choir is always looking to welcome young singers or anybody who can sing regularly. The choir is affiliated to the Royal School of Church Music. They practice most Thursday's from 7.00 to 8.00 pm and lead the music at the 10.30 am Communion and other appropriate services. They sing anthems at major festivals and other special occasions. For weddings, joint benefice services and carol services they combine with Bunny choir. The choir leader, Bill Cooper, will be pleased to hear from anyone who is interested in either joining the choir or simply helping with carol services. 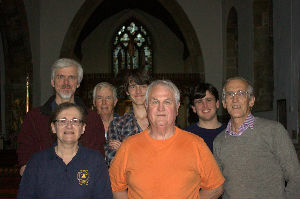 Bell ringing The Tower captain is Joan Bird and there is bell ringing practice on Monday night from 7.30pm till 9.00pm. All are welcome and Bell ringers need not be members of the Church congregation. The bells are rung before the main 10.30am service from 10.00am on Sunday. For details on the bells click here. The Mothers Union Christian Care for Families Worldwide is part of Mothers Union in the Diocese. We normally meet on the 2nd Wednesday of the month in the Parochial Church Hall, Selby Lane / Elm Avenue, Keyworth, at 2pm. Our Branch secretary is Janet Clothier and anyone interested in joining our Branch should contact her. The Annual Subscription is £22. A group concentrating on Healing Ministry led by Diana Jones. Monthly meetings are held on Mondays at 7pm to 9:15 in members homes and all are welcome. At the meetings we enjoy a hot drink and biscuits and chat around a chosen subject related to health and healing. Then we review the prayer cards that have been left by the congregation and turn to God in prayer on behalf of those named on the prayer cards. Keyworth 8 O'clock group usually meets on the first and third Wednesday of the month, during school term time, in the Parochial church Hall at 8pm. Annual membership is £5 with £2 payable at the door which includes refreshments and a raffle ticket. The secretary is Hilary Humphry.